Golden Ocala Clubside estate home with lake views! Located in the prestigious Golden Ocala Golf and Equestrian Club, you can play golf enjoy fine dining and ride your horse thru miles of private riding trails. This exceptional home is loaded with upgrades. The home features travertine tile and gleaming hardwood floors. Step into the expansive foyer of this elegant new French chateau-inspired home & sumptuous luxury greets you at every turn. The attention to detail & craftsmanship is unsurpassed. From the custom designed Jack Kluhm dual circular staircase to the imported Italian marble that graces nearly every room. Fabulous view overlooking Golden Ocala's Golf Club Hole #7, which is a replica of the famous Augusta National Golf Club Hole #16. Beautifully designed by Rutenberg, built in 2011. Walking through the front door, you will see the attention to detail throughout everyone room starting with 12 Foot Ceilings, Crown Molding, Plantation Shutters and Custom Lighting. This ultimate location and exceptional home is living at its finest. Nestled in the enclave of Golden Ocala Golf and Equestrian Club and next to the soon to open World Equestrian Center South. Inviting gourmet kitchen, granite, open plan to living room with fireplace. Entrance opens with views from sliding door walls to golf course and outdoor kitchen. Floor plan ideal for family or entertaining. This magnificent home is located in prestigious Masters Village at Golden Ocala.As you enter this elegant home complete with all amenities your heart can desire the tranquil view of the waterfall will welcome you home . Entertaining or just enjoying life is very easy to do here. The home of your dreams is located in prestigious Masters Village of Golden Ocala. A majestic live oak tree graces the entrance to this elegant home that possesses all of the amenities that your heart desires. Featuring 4 bedrooms, 4.5 baths, an outstanding well equipped kitchen, game room/den with wet bar, family room with fireplace & stunning marble floors throughout. This spectacular home is located in the first class golf and equestrian community of Golden Ocala, situated in the rolling hills of Central NW Ocala's horse country. The home reflects timeless elegance in an outstanding open floor plan. The attention to detail showcases breathtaking views of the famous Augusta Tribute Hole off the dining room, and the 17th Green from the den. Spectacular golf course view from this elegant home. From brick paver driveway step inside to enjoy the exquisite features from high volume ceilings to granite tops throughout. Master suite downstairs with corner garden tub, large walk in shower and double walk-in closets. Spectacular clubside views of the lake! Open floor plan features 3 bedrooms, 3.5 bathrooms, formal dining, chefs kitchen, living room with fireplace, spacious master suite, his/her closets, jetted tub, shower and double vanities. Upgrades include surround sound, central vacuum, high ceilings with crown moldings, security system, custom drapes and Travertine floors. END UNIT. Split floor plan with 1 bedroom on the main level and 2 bedrooms on the ground floor. The developer put in BUSBY CABINETS and stainless appliances. Lakeside at Golden Ocala! 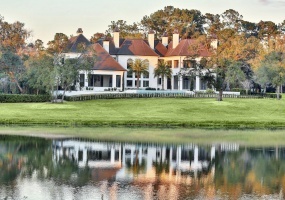 This expansive waterfront estate offers unlimited opportunities for relaxation and recreation at Golden Ocala's signature golf course, world class spa, dining and equestrian facilities. Experience quality timeless elegance. Located in the rolling hills of NW Ocala's horse country, Golden Ocala is the area's one of a kind golf and equestrian club, and this home is everything you would expect to find in such a first class community. Style, sophistication, and attention to detail are evident at every turn in this spectacular custom built home.